It comes as no surprise that with a rookie under center, the Jaguars rank last in total offense (270.6 ypg) and passing (150.0 ypg) and are 31st in points per game at 11.8. Gabbert (608 passing yards, 3 TD, 2 INT) did throw for 221 yards versus the Bengals, but 74 of that came on his scoring pass to Hill (12 receptions, 1 TD). Overall, the quarterback completed 15-of-28 throws and was sacked three times, though he wasn’t picked of. Hill led the Jaguars with five catches for a career-high 118 yards, while fellow wideout Mike Thomas (23 receptions, 1 TD) and backup running back Deji Karim added three catches each. Tight end Marcedes Lewis (8 receptions) has also been a reliable target this year when healthy, but he was held to just one catch versus Cincinnati. Even with Jacksonville failing to sustain a pass attack, Jones-Drew (476 rushing yards, 2 TD) has still been able to contribute and ran for 85 yards and a score on 19 carries last weekend. He needs just 110 yards from scrimmage to join Fred Taylor and Jimmy Smith as the only players in club history to reach 8,000, but he hasn’t run for a score on the road since Nov. 15, 2009. Jacksonville faced the league’s top-ranked defense in Cincinnati and now faces a Steelers unit that is second at 282.8 yards allowed per game. Pittsburgh also owns the top pass defense (174.0 ypg) and is allowing just 17.8 points per game. The Steelers have yet to allow 300 net passing yards in a game, with Tennessee’s total of 240 last week marking the highest they’ve permitted so far this season. With Harrison (23 tackles, 2 sacks) expected to miss another month due to a broken right orbital bone, Lawrence Timmons (30 tackles) moved to the outside spot and made five tackles, while Larry Foote (14 tackles, 1 sack) came off the bench and started on the inside. With Smith’s injury, Ziggy Hood and rookie Cameron Heyward both saw time on the field and combined for six tackles and 1 1/2 sacks against Tennessee. James Farrior (31 tackles, 1 sack) led the way 13 tackles and will combine with Woodley (19 tackles, 3 sacks, 1 INT) in attempting to keep Jones-Drew in check. Safety Troy Polamalu (35 tackles, 1 sack) added nine tackles last week and will hope to take advantage of Gabbert’s inexperience. While Roethlisberger’s five touchdown passes were impressive nonetheless, it was the running game that surprised most during last week’s win. With Tomlin opting not to use Mendenhall (173 rushing yards, 2 TD), the Steelers still averaged 6.2 yards on 28 carries, their highest since a 6.3 average on Sept. 26, 2010. The numbers were inflated a bit by Dwyer’s 76-yard run, but Pittsburgh still rushed for 100 yards in the first half for the first time since Dec. 7, 2006. It will be curious as to how Pittsburgh divides the carries this weekend. Roethlisberger (1376 passing yards, 8 TD, 6 INT), meanwhile, used his record-tying day to become the second Steelers quarterback in team history to surpass 150 career touchdown passes – along with Bradshaw — and is also just 122 yards shy of joining Bradshaw as the only Pittsburgh quarterbacks to reach 24,000 career passing yards. Roethlisberger, who completed a pass to eight different receivers, continued to hit Mike Wallace (31 receptions, 3 TD) for big plays, finding the playmaker for a 40-yard score, while Hines Ward (20 receptions, 2 TD) had a game-high seven catches and scored twice. Tight end Heath Miller (15 receptions, 1 TD) also hauled in a scoring throw from Roethlisberger. Despite their 1-4 record, the Jaguars can’t be upset with how the defense has performed this year. Jacksonville ranks eighth overall at 316.4 yards allowed per game and is 10th against both the rush and pass. The Jags have held opponents under 300 total yards in four of their five games this year, the second time the club has accomplished that in team history. Led by a pair of linebackers in Daryl Smith (36 tackles, 1 sack, 1 INT) and Paul Posluszny (39 tackles, 1 sack), Jacksonville is tied for second in the league by forcing 17 three-and-out drives and has totaled five sacks and three interceptions over the past two games. Right end Jeremy Mincey (13 tackles, 1 sack) and backup John Chick both had a sack in last week’s loss, part of a line that is expected to have Aaron Kampman back for the first time in 14 games. Kampman hasn’t played since Oct. 31 of last year due to a torn ACL. 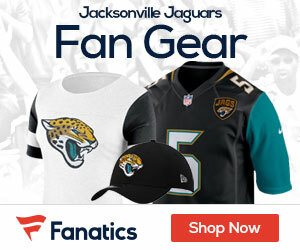 Smith, who’s questionable due to a concussion, and Posluszny both finished with nine tackles last week, while safety Dwight Lowery (15 tackles, 2 INT) had an interception, Jacksonville’s sixth of the season. Cornerback Derek Cox is also questionable after missing the past two games with a groin injury. One matchup to watch for will be Wallace against the secondary of the Jaguars. The Steelers wide receiver is a big-time threat down the field, but Jacksonville is tied for second in the league with just 13 plays of 20-plus yards allowed. The return of Kampman could be big for the Jaguars, who will need to slow down the Steelers’ run game to put pressure on Roethlisberger and his ailing foot. A healthy Kampman should help Jacksonville increase its current season total of eight sacks, which have come from seven different players. Gabbert, meanwhile, can expect no mercy from a veteran Steelers defense that will try to force him into a number of rookie mistakes. 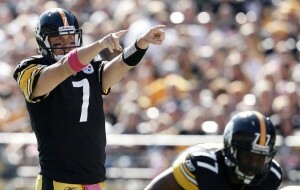 Expect the likes of Polamalu, fellow safety Ryan Clark and veteran corner Ike Taylor to pounce on mistakes.